There are numerous pancreatic and peripancreatic conditions that can mimic pancreatic neoplasms. Many of these can be confidently diagnosed on computed tomography (CT), while others will require further imaging. Knowledge of these tumour mimics is important to avoid misclassification of benign conditions as malignant and to avoid unnecessary surgery. Mimics can be grouped as parenchymal, vascular, biliary and peripancreatic. These are discussed and illustrated in this review. Alcohol and intraductal biliary calculi are the commonest causes of pancreatitis, although a variety of other aetiologies—including autoimmune, hereditary, infections and drugs—are also implicated . Acute pancreatitis is a biochemical diagnosis and imaging is reserved to evaluate for sequelae such as necrosis and vascular complications. 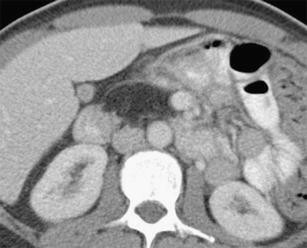 Diffuse pancreatitis is rarely a diagnostic challenge. However, focal pancreatitis may mimic pancreatic neoplasms. Acute pancreatitis is seen as reduced attenuation with associated peripancreatic inflammatory changes while the fibrosis of chronic pancreatitis may appear as mass lesions. Unfortunately, the imaging findings of acute and chronic pancreatitis overlap with those of pancreatic carcinomas. Both conditions may produce focal pancreatic enlargement, hypoenhancing lesions with mass effect (Fig. 1), dilatation of the pancreatic and common bile ducts, duct strictures and increased density in the peripancreatic fat [1–3]. Further complicating matters are the increased incidence of pancreatic carcinoma in patients with chronic pancreatitis . A variant of focal pancreatitis is a rare condition known as groove pancreatitis, which is isolated to the head of the pancreas in the ‘groove’ between the duodenum and common bile duct. It is most frequently induced by alcohol  and the condition can prove diagnostically challenging as it frequently presents as a hypoenhancing mass lesion. Fibrosis is prominent and cystic change may occur within the adjacent thickened duodenal wall with associated duodenal stenosis . Because of the fibrosis, the common bile duct and main pancreatic duct may become stenosed with subsequent upstream dilatation. Identification of cysts in the duodenal wall and the presence of Brunners gland hyperplasia [6, 7] may suggest the diagnosis, but unfortunately there is considerable overlap with ductal adenocarcinomas and therefore histological sampling is often required . A pseudocyst is defined as “a collection of pancreatic juice enclosed by a wall of fibrous or granulation tissue, which arises as a consequence of acute pancreatitis, pancreatic trauma or chronic pancreatitis” . Pseudocysts are the most frequent pancreatic cystic lesion , complicating up to 55% of cases of acute pancreatitis, and may be intrapancreatic or extrapancreatic, solitary or multiple and with a wide variation in size. Pseudocysts are most frequently unilocular with a smooth regular wall (Fig. 2). A number of imaging features have been identified to help differentiate pseudocysts from cystic pancreatic neoplasms (Table 1). A lobulated shape, wall thickness less than 1 mm and smooth internal surface have been identified as benign features, while a round, oval or tubular shape is suspicious for malignancy along with a thick wall with irregular inner margin . There was no statistical difference with location within the pancreas, cyst density or cyst size . A large surgical review of 220 patients identified three features as suspicious for malignancy: (1) presence of a solid component, (2) peripheral calcification and (3) dilatation of the main pancreatic duct, with a combination of these features being more concerning than any one feature alone . However, two or more of these features have a sensitivity of only 34% and specificity of 97%. Indeterminate cases should be referred for endoscopic ultrasound evaluation with aspiration of cysts for biochemical and cytological evaluation, which has been proved to be accurate at differentiating cyst types . Multiple systemic diseases are associated with pancreatic cysts, with von Hippel-Lindau (Fig. 3), cystic fibrosis and autosomal dominant polycystic kidney disease being the most frequently encountered. Small cysts may also be the sequelae of pancreatitis, or be true congenital cysts. In a study with 1,444 patients Zhang et al. found pancreatic cysts in 19.6% of patients with an increasing incidence with age. Most were small measuring less than 10 mm, with just over half being solitary and most being simple. Malignant cysts were only seen in 5.7% of all patients with cysts and 26.5% of patients had pancreatitis. Often pancreatic cysts are approached in a rather aggressive way to avoid missing a cystic neoplasm. However, simple cysts measuring less than 2 cm in patients without a history of pancreatitis or systemic cystic disorder may slowly grow over time, but are rarely associated with morbidity or mortality . Moreover, the presence of a pancreatic cyst measuring 5 mm or greater was an independent risk factor for future development of a pancreatic cancer . Fat infiltration and replacement of the pancreas may be idiopathic, or related to metabolic causes such as diabetes and hyperlipidaemia, cystic fibrosis, chronic pancreatitis and pancreatic duct obstruction. It can occasionally be caused by adjacent insulinomas . Similar to fat deposition elsewhere, it may be diffuse (Fig. 4) or focal (Fig. 5) and the computed tomography (CT) attenuation of the involved parenchyma is reduced. The anterior aspect of the pancreatic head, a derivative of the embryological dorsal anlage, is most frequently involved, while the posterior aspect and parenchyma immediately surrounding the common bile duct, which are derived form the ventral anlage, are typically spared [18, 19]. When pronounced, a negative Hounsfield unit may be seen on unenhanced studies; however, mild cases may mimic a hypodense mass. Recognition of the area involved, lack of ductal dilatation and absence of distortion of the pancreatic contour are clues to this benign diagnosis. Most suspected cases should be clarified with MRI with chemical shift acquisitions, which have proved useful in differentiating focal fat infiltration from pancreatic neoplasm . Intrapancreatic lipomas, previously thought to be rare, are being increasingly encountered. These are well-defined, homogeneous masses that do not show contrast enhancement and maintain low attenuation values of fat (Fig. 6) . They are typically small, do not cause ductal obstruction and are asymptomatic. Arteriovenous malformations (AVMs) of the pancreas are rare lesions that may be asymptomatic although they frequently present with gastrointestinal haemorrhage secondary to portal hypertension with pancreatitis also having been reported as a presenting complaint . They typically appear as enhancing masses containing tortuous tubular vessels that follow the density of adjacent normal vessels (Fig. 7), with early enhancement of the portal venous system . Their location within the pancreas is variable as is the size, with reported lesions varying between less than 1 and 10 cm. Aneurysms from the splanchnic arteries are uncommon, with aneurysms of the pancreaticoduodenal and pancreatic arteries representing just 2% of all visceral artery aneurysms, and with 5% arising from the superior mesenteric artery . Although many of the reports of pancreaticoduodenal artery aneurysms in the literature have presented with rupture and subsequent haemorrhage , they are being more frequently encountered as asymptomatic incidental findings with increasing use and improvements in abdominal CT. They may relate to atheroma, connective tissue disease, trauma, pancreatitis or be mycotic. Similar to aneurysms elsewhere the aneurysm follows the adjacent native vessel enhancement in all phases while thrombotic elements do not enhance and remain as soft tissue attenuation (Fig. 8). Peripheral calcification can occasionally be seen. Multiplanar reformations and multiphase imaging allows confident diagnosis . Choledochal cysts are rare congenital dilatations of the biliary tree that may involve the intra- or extrahepatic bile ducts or both . They are more common in females and Asians and may present with upper gastrointestinal symptoms such as pain, nausea, vomiting, jaundice, or with pancreatitis, cholangitis or biliary malignancy within the cyst [28–30]. Uncomplicated cysts will appear well defined and with fluid attenuation on CT, while when calculi, sludge or debris are present they may be more heterogeneous (Fig. 9). Demonstration of a tubular nature of the area is a clue to the diagnosis, which can be confirmed with either CT cholangiography or MR cholangiopancreatography. Accessory spleens are common and because of embryological development with the pancreatic tail they may be closely applied to the pancreatic parenchyma or truly intrapancreatic. They are typically small, measuring 1–3 cm, are well defined and have similar enhancement to the spleen during all phases (Fig. 10) . Because they enhance differently to the adjacent pancreatic parenchyma they may be mistaken for neoplasm , leading to inappropriate surgery. The diagnosis can be confirmed using supraparamagnetic iron oxide (SPIO)-enhanced magnetic resonance imaging (MRI), sulphur colloid imaging or heat damaged red cell scintigraphy. Diverticuli from the duodenum are common, occurring in up to 22% of patients , and are usually asymptomatic. They can be complicated by perforation, haemorrhage and duodenal diverticulitis . They most frequently arise from the second and third parts of the duodenum, and are usually less than 5 cm in size. Because of their communication with the bowel lumen, they typically contain both fluid and air (Fig. 11), which usually poses no diagnostic challenge . However, completely fluid-filled diverticuli may be mistaken for cystic pancreatic neoplasm [36, 37]. To further complicate matters, Lemmel first described periampullary diverticuli producing biliary obstruction, findings that have subsequently been widely confirmed [38–40]. In indeterminate cases, multiplanar CT with positive oral contrast agents may show contrast material entering the diverticulum to establish the diagnosis. MRI has also shown promise in challenging cases . Other duodenal pathological features that may be mistaken for pancreatic neoplasia are congenital duodenal duplication, duodenal haematomas and duodenal malignancies (Fig. 12). Annular pancreas may be mistaken for enlargement of the pancreatic head, or the centrally located duodenum may be mistaken for a focal lesion if this congenital anomaly is not recognised (Fig. 13). There are multiple normal lymph node groups that surround the pancreas. These can become involved in multiple disease processes, including mycobacterial infections (Fig. 14) , gastric, biliary and hepatic malignancy , pancreatitis , lymphoma , sclerosing mesenteritis  and sclerosing cholangitis . They are typically hypodense compared with pancreas in the arterial phase and often a fat plane may be demonstrated between the nodal mass and pancreas (Fig. 15) . Furthermore, lymph nodes inferior to the renal veins virtually exclude pancreatic adenocarcinoma . The pancreas may be invaded directly by a number of tumours such as adrenal carcinomas, gastric carcinomas and gastrointestinal stromal tumours (GISTs), renal tumours and retroperitoneal sarcomas. Determining the epicentre of these tumours can help to identify their true organ of origin. A number of pancreatic and peripancreatic conditions may mimic pancreatic neoplasm. A thorough knowledge of these and detailed interrogation of all lesions will allow many to be accurately diagnosed on CT. Lesions that remain indeterminate may require further investigation.